Joralti Ltd. is a leading Bulgarian producer of textile belt holsters for pistols and revolvers. Some of our products are textile pancakes, textile form-fitted holsters, holsters with clip, hanging holsters, holsters for back carrying, ankle holsters, holsters with leather loop among others. Joralti holsters are suitable for Makarov, Walter, Р22, AP, PPK, Beretta, Arcus, TT, Glock, HS, PSM, HK, USP Compact, Stayer, Sig, Viking as well as other pistols and revolvers with different barrel length. The product range includes other hunting and weapon accessories as well. All our products are made using high quality materials from leading Bulgarian and international producers - Cordura, leather and plastic facings. Material: Cordura Suitable for Makarov, AP, Walter PPK and PSM. 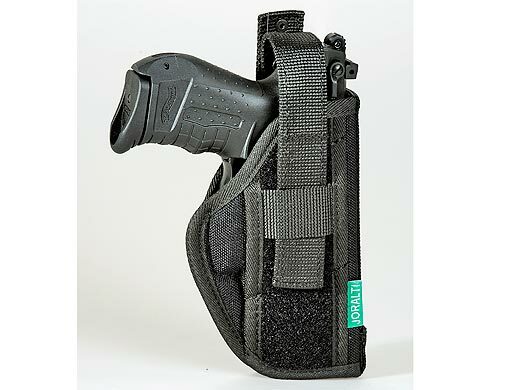 Material: Cordura Textile holster for inside carrying with plastic clip Suitable for all pistols Please specify the exact pistol model when placing your order. Material: Cordura Suitable for Makarov Textile form - fitted holster with plastic loop which ensures 2 point stable fixture. Material: Cordura Suitable for CZ, Glock, Sig Sauer, Steyr and others. Material: Cordura Suitable for Makarov, AP, Walter, PPK and others Textile pancake Makarov with volume. Textile beaded holster with a plastic nut, providing a stable two point attachment. Material: Cordura. Suitable for PMI-75 B, Beretta, Arcus, TT and others.